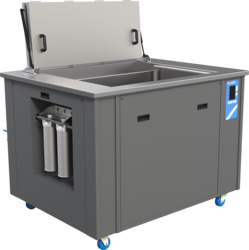 Providing you the best range of ultrasonic cleaner and ultrasonic cleaning tank with effective & timely delivery. Bigger tank with Special basket for cleaning. S.S. 304 Housing available for rugged conditions. Digital LCD display for smooth working. Ideal for any kind of difficult cleaning objects. Heater & Timer Function available. Strong transducer for years of operations. S.S. 304 inside Cleaning Tank for all Models.